If you’re as eco-conscious as I am, you’ll love our latest prize draw. We’ve just launched Bobble Bottles on the site – they’re handy new bottles that not only filter water as you drink but are eco-friendly too. And there are 10 to win in our latest competition. They’re made of recycled plastic, and can each save 300 regular water bottles from your rubbish bin. They come in a range of colours, but only the winners will have the green filters; we’re saving them just for you. 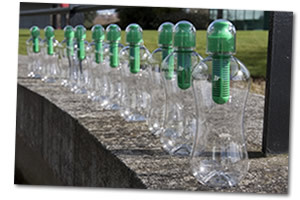 Email competitions@ocado.com with the subject line 10 Green Bobble Bottles. Make sure you include your full name in the message. Then, tell us why you’d like to win a Bobble Bottle in no more than 100 words. Entries need to be in by the 25th March 2012, so get emailing today. We’re expecting some really creative responses to match this creative product. So, whether you want a Bobble Bottle for theme park queues or to squirt water at your kid brother, we can’t wait to see your ingenious/practical/silly (delete as applicable) answers. This Bobble Bottles competition is open to all UK residents aged 18 or over (except for anyone directly connected with the planning or administration of this Bobble Bottles competition) who have emailed competitions@ocado.com with the reason they’d like to win a Bobble Bottle by 25/03/2012. Prize Details: There are 10 prizes of one Bobble Bottle with a green filter (1 litre size). The closing date and time for entries into the Bobble Bottles competition is 23.59 on 25/03/2012. The winners of the prizes will be contacted within 5 days of the draw and will be given full details of how to redeem their prize. If a winner cannot be contacted or does not respond within 14 days of the initial notification, or cannot take up the prize, then Ocado reserves the right to select another winner. All entry instructions form part of these terms and conditions. By entering this competition, all participants will be deemed to have accepted and be bound by them. The promoter of this competition is Ocado Limited. For details of the winners’ name and counties please send a SAE to the Marketing Department, Ocado Limited, Titan Court, 3 Bishops Square, Hatfield Business Park, Hatfield, Hertfordshire AL10 9NE. This entry was posted in Talking Ocado and tagged Bobble Bottles, prize draw by Ocado. Bookmark the permalink.